You guys! My heart is exploding with excitement over my newest contributor. Steph from The Silly Pearl is so fabulous and when she agreed to write the occassional post for my blog I was so thrilled. She is AH-MAZ-ING! She paints, sews, crafts, cooks, creates printables, hosts a party... I will admit to being jealous of her craft room! She does it all! And I know you are going to love her as much as I do. Okay.. enough gushing.. let me present her project for you guys! Hello everyone! My name is Steph and I blog at The Silly Pearl. 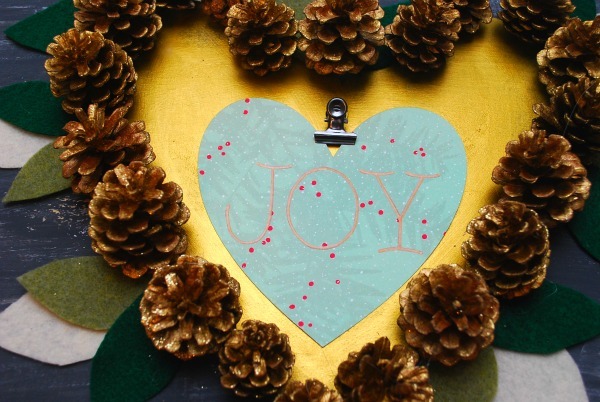 I'm thrilled to be here on The Kim Six Fix today and every other month to share a craft with you! Thank you Kim for having me on the blog! 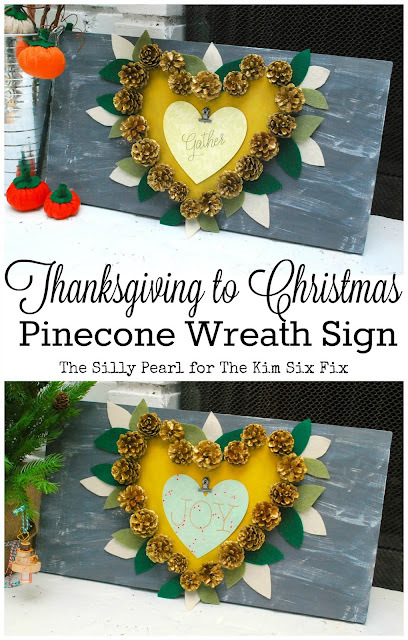 Today I'm sharing how to make this Thanksgiving to Christmas Pine Cone Wreath Sign. The pine cones and felt leaves are neutral enough to transition from one season to another, and all you have to do is swap out the sign in the middle! Here's how I made it. 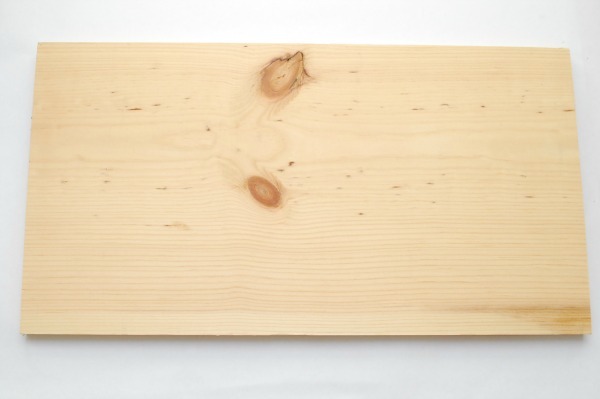 I started out with a piece of wood from the garage, but you can use a ready-made plaque or pallet from the craft store. My piece was 21 by 11 inches. I know, an odd size, but it's what I found! Whenever I paint something flat like this, I like to put some push pins at the bottom to elevate it. 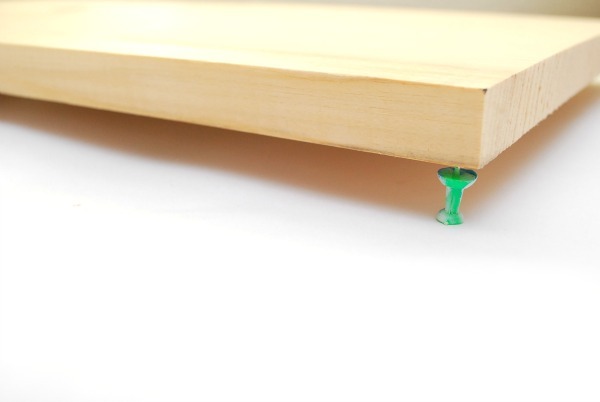 This makes painting the sides much easier, plus you have a place to grab your piece without smudging the paint. This also works with picture frames and wooden letters! 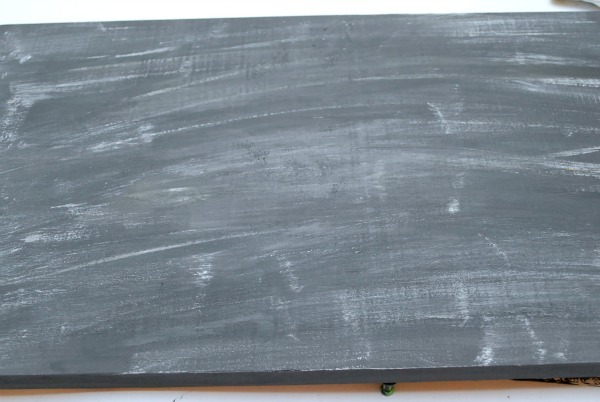 I painted my wood piece all over with dark gray chalky finish paint. Then to get a sort of white-washed affect (my easy method! ), I dry-brushed some white chalky finish paint over the top. Then, I used some sand paper to tone down any of the too-white parts. 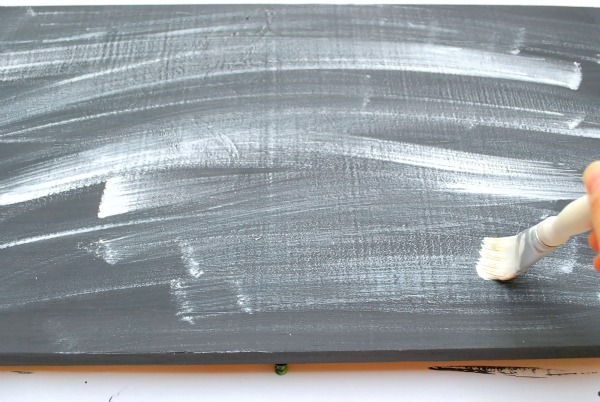 I also went over it one more time with a dry brushing of the original dark gray to finish it. 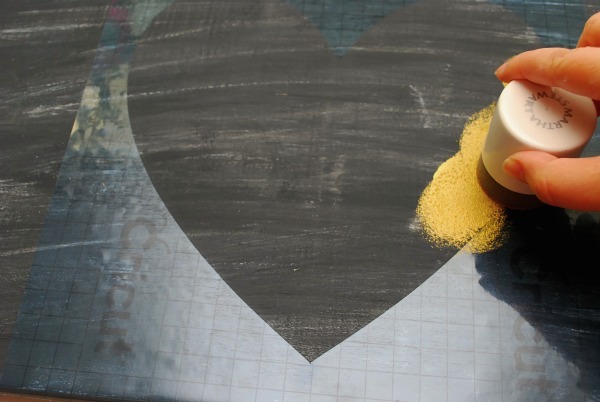 When the paint dried, I stenciled a large heart in the center, leaving about two inches at the top and bottom. 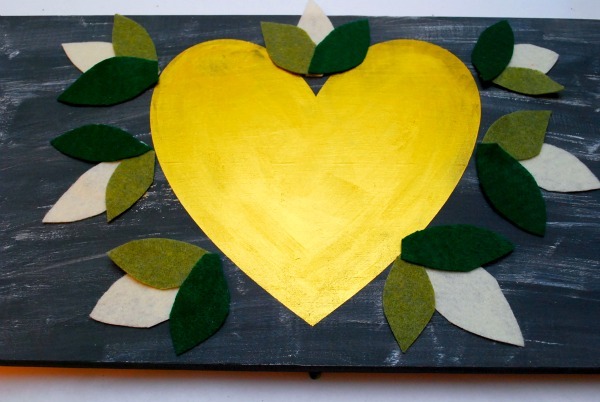 I cut out my own stencil using vinyl and a simple heart shape, and used metallic gold paint. Once dry, I went over the whole sign with a coat of satin varnish. Next, I cut out some simple leaf shapes out of green and cream colored felt. I thought these colors would work for both Fall and Winter. Then I arranged them in threes all around the heart, and hot glued them to the sign. 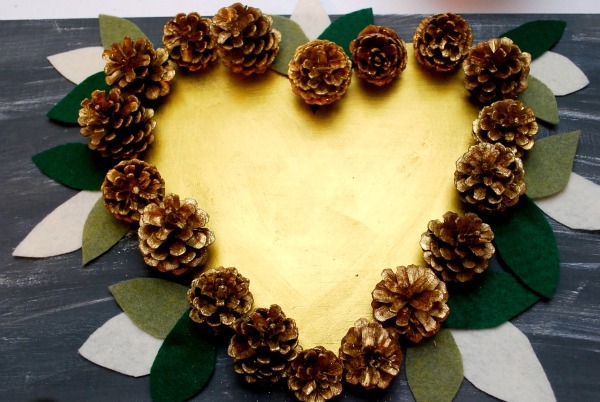 Then I hot glued some pine cones all around the border of the heart, over the tips of the leaves. My pine cones were 1.5-2 inches tall. I like the 3D effect, but I wouldn't go bigger than that for a sign of this size. 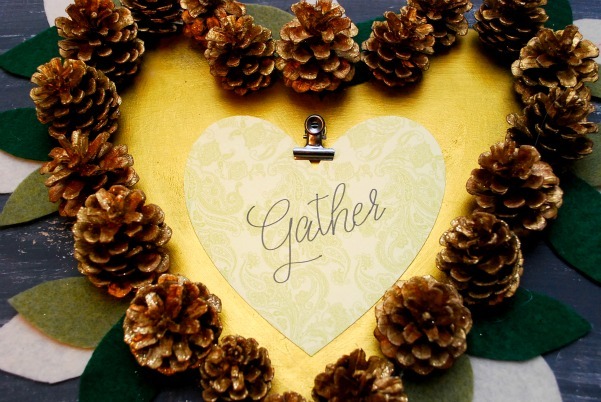 You can also use mini pine cones. And come December, all you have to do is switch out the hearts! You can even keep one sign behind the other so you won't lose them, if you're prone to that (like me). Right now, I've got my Thanksgiving sign on my fireplace hearth. And after Thanksgiving, it easily becomes a Christmas sign. The only other thing I have to do is swap out the pumpkin tree for a Christmas tree. Which my cat has already knocked over. I guess this means she's in the "it's still too early to decorate for Christmas" camp. Hope you'll come on by The Silly Pearl to check out more of my tutorials. 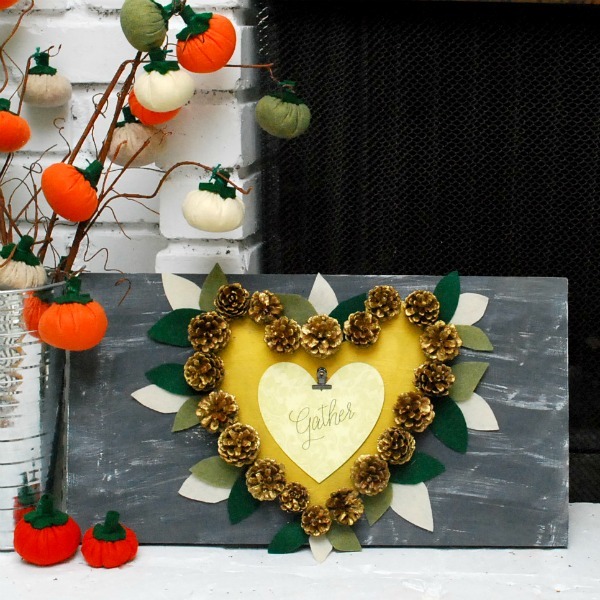 I love all kinds of crafts, including sewing, jewelry making, furniture redo-ing, and more. 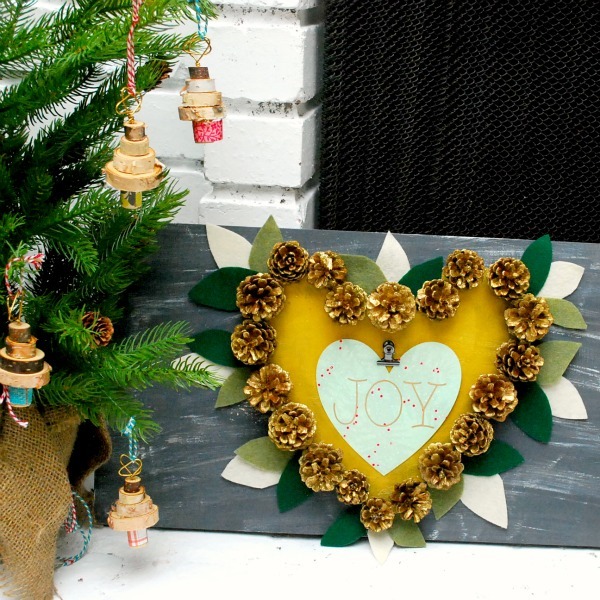 Thanks for having me on the blog, Kim, and see you all again in the new year!